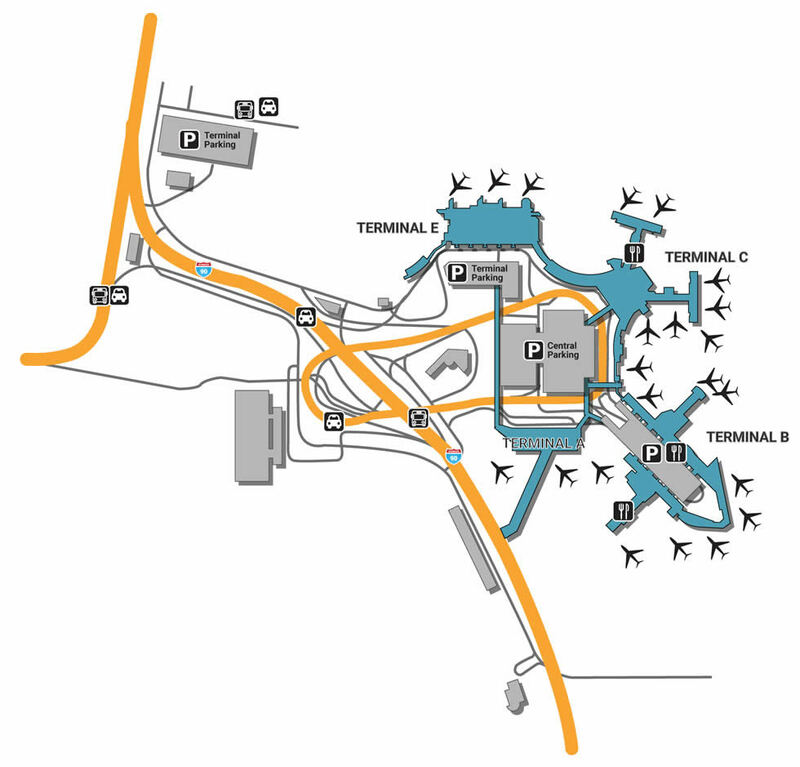 While you are traveling through Boston Logan International Airport you can discover the many amenities and locations throughout the terminals with our maps of the terminals. If it’s your first time in Boston, the first thing you’ll see is most likely Logan International Airport, and as one of the busiest facilities in the country, you’ll be sure to feel the camaraderie. De-stress by spending some time enjoying the amenities, whether it’s the simplistic parking map on the outside or the unique services on the inside. With a variety of things to do and distract yourself with, delays can easily turn into minutes, perhaps hours of fun. There are four main parking lots at Logan Airport, all of which are reasonably priced. For hourly parking, head to either the Central Parking Garage, Terminal B Garage, or Terminal E Lots, all of which are located directly at the airport. Travel a bit further down Interstate 90 for long-term parking, utilizing the low-price weekly rate at the Economy Parking Lot, which is a ways from the airport, but still easy to access with the help of the complimentary shuttle service. If you’re a family stuck at Boston Logan, consider your time well-spent by treating the kids to Kidport, a series of play areas scattered across the facility that gives parents the opportunity to not only keep their children calm, but in good spirits before they take off. Located at Terminals A, B, and C, there’s also a slue of nearby changing rooms for babies. If you’re more in the mood to unwind as an adult, open your mind to the abstract art that hangs as part of the public art program. While you’re waiting for your flight to come, spend some time doing what Americans do best - shopping! Whether it’s a quick birthday present at GoGo Gifts or the uniquely curated wardrobe at Black Dog, which features options for the whole family (including a dog), you’ll be sure to be entertained at least for a few hours. While you’re browsing, enjoy name-brand stores like Victoria’s Secret (Terminal C), Sunglass Hut (Terminal B), and Michael Kors (Terminal E). One of the main things everyone looks forward to without actually saying it is airport food - when you hear news of a delay, it’s always the first thing you think. Turn a bitter moment into something sweet at Pinkberry Yogurt (Gate C) or experience the retro environment at Lucky’s Lounge (Gate A), surrounded by a hip atmosphere and serving classic American delights like burgers, salads and sandwiches. For those interested in catching a buzz before catching their flight, grab a beer at Sam Adams Brewhouse, located right outside Terminal C.